We are pleased to announce the release of AVCC, an open-source web application for the rapid inventory of physical film, video, and audio materials. Developed with funding from the Library of Congress’ National Recording Preservation Board – in addition to funding support from the Metropolitan New York Library Resource Council and New York State Documentary Heritage Program for previous versions of the tool – AVCC provides a series of inventory templates and quantitative reports that promote simple and fast documentation and analysis of collections of audiovisual materials. The National Recording Preservation Plan, published by the Library of Congress in December 2012, has underscored the great risk that audio recordings are at for massive loss if preservation action is not taken in the very near future. In doing so, the Plan has identified the challenges to preservation, as well as an outline for moving ahead with taking action. Production-based, archival, and other collections of unpublished media can often be difficult to fully identify and describe in order to support access and preservation, especially if time and technology do not allow for playback of the materials. AVCC relies on a minimal set of fields, representing information that is readily available when inspecting a physical media asset. This makes inventory creation quick, easy for non-specialists, and generates information that can be used to plan for digitization, storage, and care of audiovisual assets. A more extensive set of technical and descriptive fields are provided, but at its core the focus of AVCC is the rapid documentation of assets in order to overcome backlogs and promote the preservation of our audiovisual heritage. To register for a free account go to https://avcc.avpreserve.com/login. Contact avcc[at]avpreserve[dot]com with any questions. Contact info[at]avpreserve[dot]com if you are interested in developing additional functionality or extended implementations for AVCC. 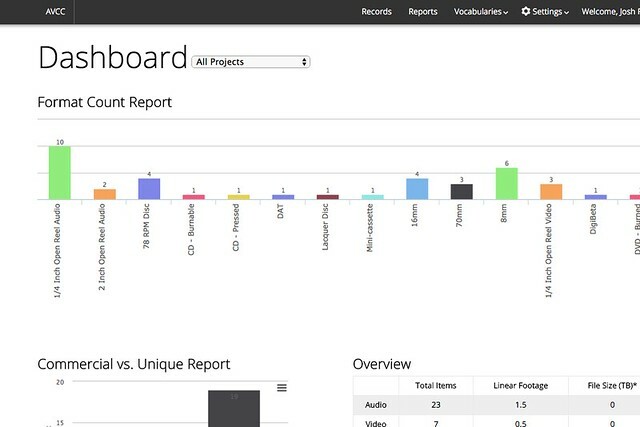 • Enables teams to work collaboratively and enter data simultaneously. 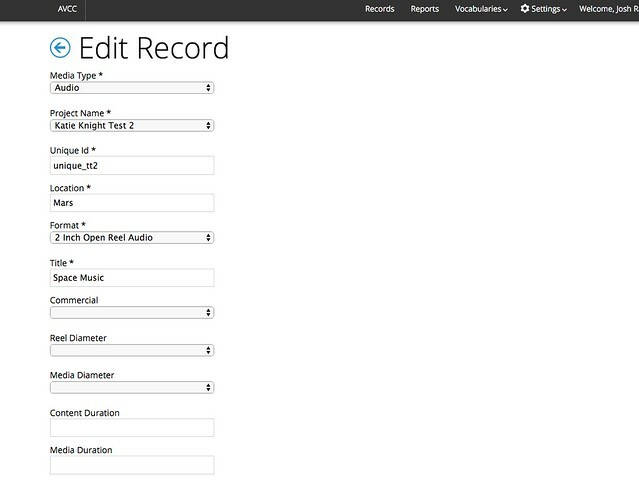 • Data entry templates for film, video, and audio materials featuring controlled technical vocabularies and format specific fields. • Ability to customize templates by moving the order of fields and making fields hidden or viewable. • Faceted browsing and keyword searching across all fields. • Ability to create multiple unique Projects within an organization, each with its own customized template and controlled access for inventory staff. • Full export of all data entered. • Import of existing inventory records. • Graphical reports showing counts by format, base type, reel or disc diameter, acid detection strip readings, film color type, and more. • Scheduled daily backups of data sent via email.